The dynamics of networked commerce combined with the essentially free replication of digital offerings has created devilish problems that our current economics has yet to tame. Sellers have no clear rationale for setting prices and consumers feel they should not have to pay anything at all. One way to step back and re-think this is to do a "thought experiment," as has proven valuable in the development of science. Some notable thought experiments involve imagining benevolent "demons" with special powers and/or knowledge: Laplace's demon, with its perfect knowledge of the state of the universe and all its natural laws, and Maxwell's Demon, with its ability to individually sort hot from cold molecules. * Maybe we cannot build such demons, but thinking about them can clarify concepts and possibly point to approximations that can be built, or can suggest directions for looking outside the box. The demon I propose is one that can power a system of commerce. Imagine a demon that has perfect ability to read the minds of buyers and sellers to determine individualized "value-in-use" -- the actual value perceived and realized by each buyer, at each stage of using a product or service -- such as songs or articles or e-books, either in a subscription or item-by-item context. The demon knows how each buyer uses the service, how much they like it, what value it provides them, and how that relates to their larger objectives and willingness/ability to pay. It understands the ever-changing attributes of current context, where the value of a given item can depend on when and how it is experienced. The demon can go even farther, to act as an arbiter of how the economic surplus can be shared fairly between the producer and the consumer. How much of the surplus should go to the consumer, as a value gain over the price paid, and how much of the surplus should go the producer, as a profit over the cost of production and delivery. This commerce demon could thus serve as the brains of a system that sets prices that are adaptive and personalized -- to set a price for each person, at each time, that is fair to both the producer and the consumer. Imagine we could build an e-commerce system, with advanced programming and data that worked as an artificial intelligence version of this demon. We could build services like Amazon, iTunes, Netflix, or a newspaper subscription that were priced by the demon. Prices would not be pre-set by the seller, but would be set dynamically by the demon at levels that would be fair and acceptable to both the buyer and seller. With such a demon setting prices, we could reap the cornucopia of goods and services that the infinite replication of digital offerings promise ("information wants to be free") while still providing fair profits to the producers ("information wants to be expensive"). Every consumer who is willing to pay more than the marginal cost of production would be able to buy, while those who get and can pay for significant value would pay appropriately higher prices. 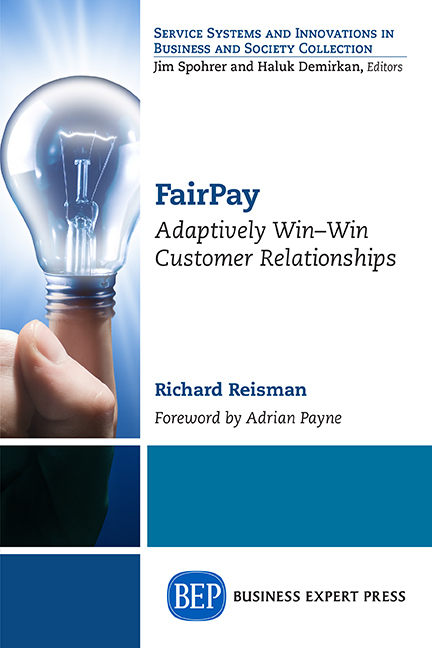 FairPay shifts our perspective from individual transactions to a series of transactions over time in a relationship. 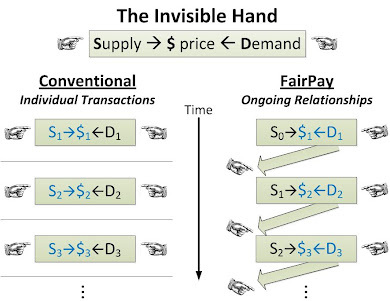 Instead of the invisible hand of supply and demand pushing from outside, it brings an invisible handshake in which the buyer and seller agree to cooperate to find a fair basis to exchange value. This can inform a new balance of powers, based on "dialogs about value." The buyer's power is to set prices for a current transaction -- "fair pay what you want" -- with the understanding that he agrees to be fair, and that this is a temporary privilege that the seller will continue only as long as he agrees the prices set by that buyer are usually fair. The seller's power is to decide whether to continue these attractive offers, or not. That gives the buyer full buy-in on all prices, but motivates him to keep up his end of the bargain. Additional data feeds in to the process, including the seller's suggested price to each buyer, the buyer's reasons for pricing higher or lower, and all of the increasingly rich individual details that digital system instrumentation can make available about usage levels, patterns, and contexts, to inform and validate these dialogs. Based on all of that, the seller tracks each buyer's fairness rating, much like a credit rating. Consumers will warm to the idea of this pricing privilege, and will seek to protect their fairness rating just as they do for credit ratings. The result is an emergent process that seeks to discover the price, just as the demon understands it. The approximation may start out being quite crude, but digital sellers can afford some unprofitable cycles in the early stages of each relationship, if that soon leads toward convergence on fair prices. As experience is gained, this will become a science of Big Data and predictive analytics -- one that works to serve both the buyer and the seller. 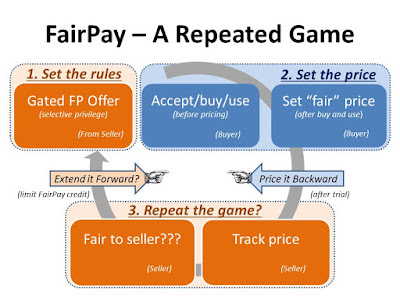 So this FairPay process acts as an engine that approximates what the demon knows. It draws out the knowledge of the buyer, encourages truth-telling, nudges that with the views of the seller, and provides a context for the dialogs about value that lead to a fair split between the producer and consumer surplus. Such a process can totally change the game of selling digital stuff, for more profit, and more value to society. To consider the broader implications of this new approach, see this sequel: An Invisible Handshake for The Digital Wealth of Nations. I should have added that there is a proven way to approximate my value demon -- but one that has been restricted to high-end, sophisticated industrial markets, and generally ignored in most other markets. As described in a 2014 HBR article, companies like GE are increasingly realizing that set prices are not best for either the supplier or the customer --and for large industrial products or services, it is better to develop custom prices very much along the lines of what the demon knows. These "value-based" pricing or "outcomes-based" models work well for such industrial equipment where a cooperative team of both producer and customer can negotiate not a specific price, but a method of analyzing value as actually achieved by the customer in use, and then basing the price on that after the data is known. Just as the Internet of Things is making that more widely applicable, FairPay points to how a lightweight, heuristic variation on that theme can work for computer-mediated mass consumer markets..
Laplace's Demon, has been influential in philosophy and physics, as one who has perfect knowledge of both the current state of the entire universe, and all the laws of nature. Thus Laplace's demon can look forward or backward to derive the exact state of the world at any past or future time. This is relevant to questions of free will versus determinism, and to quantum uncertainty. Maxwell's Demon, has been influential in thermodynamics, as a gatekeeper in a box with two chambers separated by a small hole with a door. 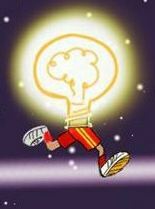 The demon can control the door to allow high speed molecules to go from left to right only and low speed molecules to go from right to left only, thus making the left side get colder while the right side gets hotter. This would violate the second law of thermodynamics. Adam Smith's invisible hand can be thought of as a similar demon that helps balance supply and demand in a market at a given point in time. As we know, Smith's demon actually works fairly well for many markets. I propose that the workings of FairPay enable something much like first degree price discrimination, but instead of all the surplus going to the monopoly, my demon shares it fairly between producer and consumer. And since resale of digital services can often be made impractical, the arbitrage problem generally does not apply. A nice bit on how Einstein's thought experiments changed the world is Walter Isaacson's "Light Beam Rider" piece in the NY Times (10/30/15). I agree that richer variations on this demon are very interesting. 1) Yes, I see FairPay as feeding into creation of customized packages, and even customized products, driven by demand/value feedback. This is a direct extension of personalization of products and packaging, and what we might think of as predictive value analytics could be very effective. 2) Yes, the demon would factor in all relevant dimensions of value. Doing this between producer and consumer is most direct, but it could also extend through the supply/value chain, such as to fairly allocate compensaton between distributors and content creators, in dialog with the consumer. This could be a simple as a Spotify bonus payment from the consumer that is specifically directed to the artist.